WSU Extension Island County provides educational and networking assistance to production agriculturalists and small-acreage landowners involved with food & fiber production, animal husbandry, horticulture, floriculture, and forestry/woodlot management. Take your farm business to the next level with this 11 week course. 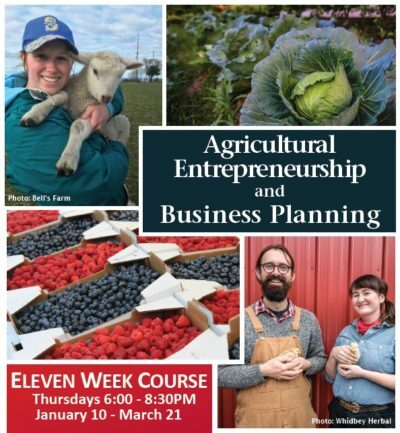 A unique combination of guest speakers, in class discussion and assignments in a video-conference setting, this course dives into the business side of running a farm, from sales and marketing to financial management. At the end of the course, you will have the core elements of a business plan to guide your farm forward. Course fee is $260 per farm. AgWeatherNet provides access to current and historical weather data from Washington State University’s automated weather station network along with a range of models and decision aids. The weather data, advisories, customized weather alerts and decision support systems provided by AgWeatherNet and WSU can help improve production and product quality, optimize resource use and reduce environmental impact. Current weather conditions at Coupeville. Current weather conditions at Langley. A full range of weather data from 175 stations across Washington state is available here.